Choosing a WordPress theme for your portfolio website can be a time consuming and overwhelming task. So we’ve made a list of 15 portfolio WordPress themes 2017 that might be of interest to you because they’re mobile friendly, SEO optimized and have extensive customization options. Also each of the themes can be used as many times as you want (all themes come with unlimited domain usage). 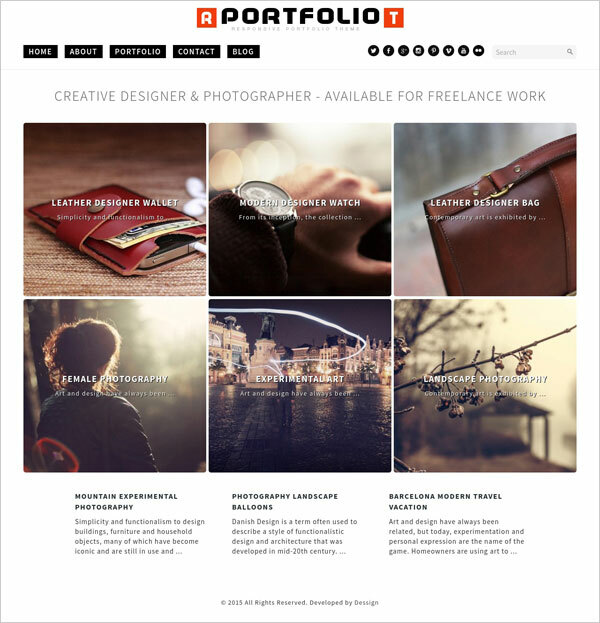 Below you’ll find 8 free portfolio WordPress themes and 7 premium portfolio WordPress themes. Free themes look nice right out of the box, but if you want more flexibility and free support, consider one of the premium themes. Btw, each premium theme is available for $39. The price includes the theme itself and also fast and comprehensive technical support from the WordPress experts who know the theme inside and out. Enjoy the collection and don’t forget to check out the demos so you can see if any of these theme meets your needs. 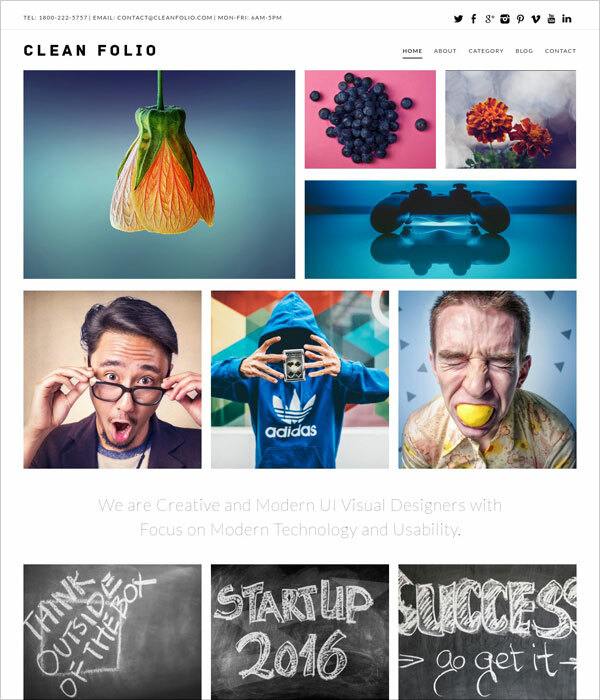 Creative is a free WordPress theme that you can use to build a compelling portfolio website. It has a responsive layout, a clean design, a stylish image slider, a sticky menu, and many other features. You can easily customize the Creative theme without touching any code thanks to Theme Options. This WordPress theme is meant for photographers, web designers, illustrators and other creative people. 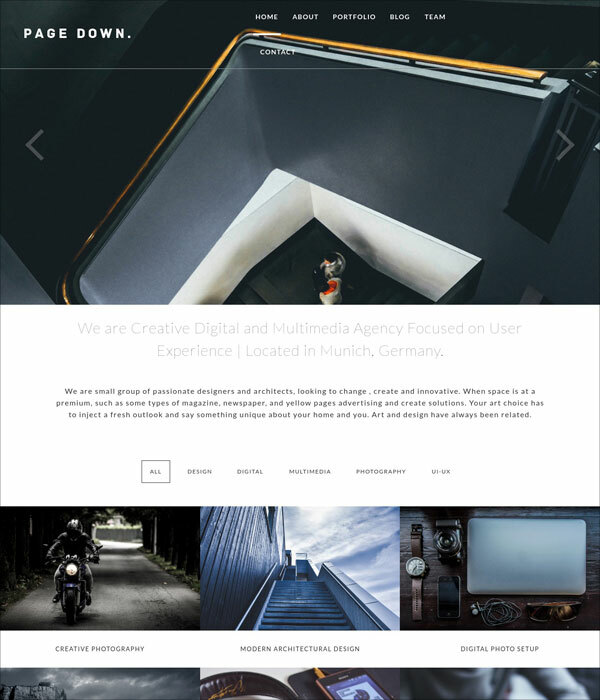 Screen is a free responsive WordPress theme that allows you to build a modern portfolio website be it a personal portfolio, a company portfolio, or a photography website. The homepage looks minimalistic: it uses a full-width slider for featured items and a sticky menu. The other pages are: About, Portfolio, Blog and Contact. Check this theme is you like clean and stylish layouts. 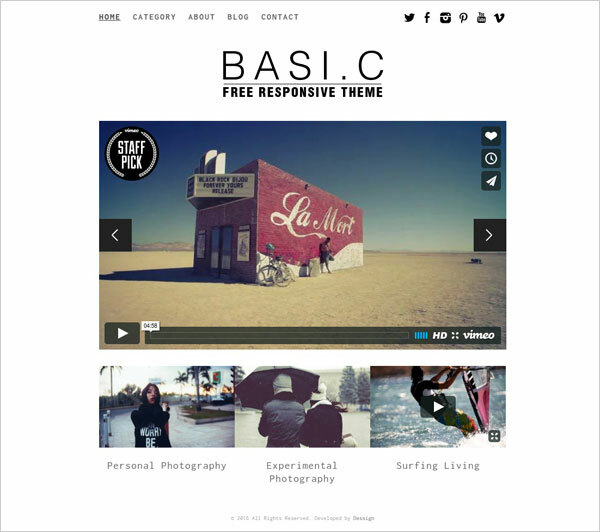 Basic is a stunning portfolio WordPress theme that is available free of charge. 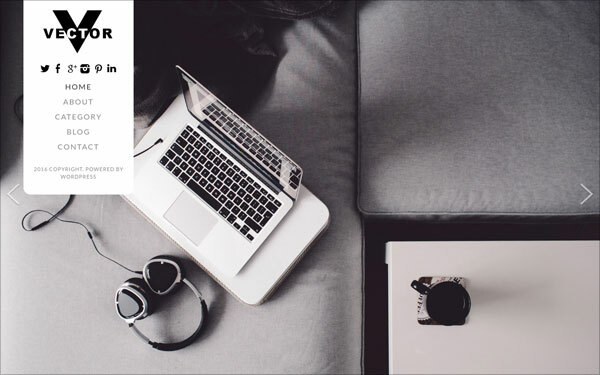 Use this theme if you want to showcase your best works in a blog format. As for the features, the Basic theme is responsive, search engine optimized and cross browser compatible. Also it comes with a nice slider which is good for both images and videos. Click the demo link to see the theme in details. 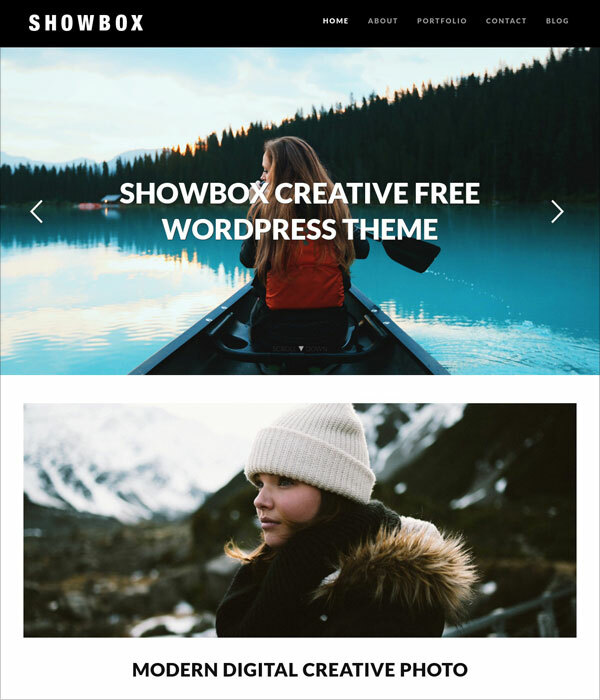 ShowBox is a free portfolio WordPress Theme that is clean, mobile friendly and search engine optimized. 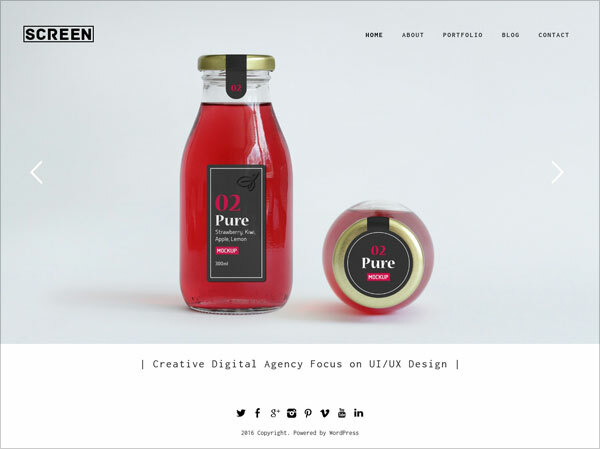 The theme is perfect for designers, photographers, artists, creative businesses and companies looking to build stunning portfolio websites or photography blogs. It should be also mentioned that ShowBox is really easy to customize because it comes with a Theme Options panel. 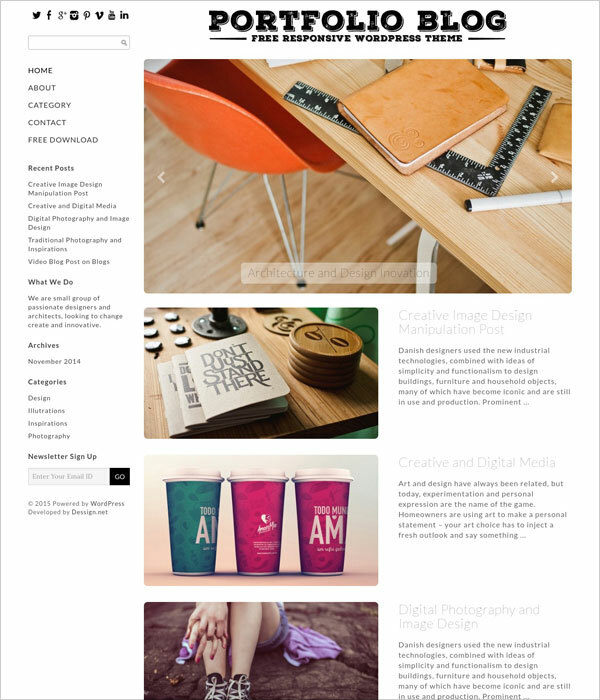 Here is another item on the list of Portfolio WordPress Themes. Its name speaks for itself. The theme is a nice solution for everyone who want to showcase their works in a clean and professional manner. Responsive grid style layout, infinite scroll, sticky navigation bar are just a few features of this beautiful WordPress theme. Portfolio Blog is a free WordPress theme that will help you build a stylish blog on WordPress. Choose this theme if you not only want to showcase your best works, but also want to describe them properly. Here are some features that you might like: responsive layout, responsive image slider, left sidebar, custom background color, hover effect, theme options, etc. Check the demo to have a better understanding of the Portfolio Blog theme. 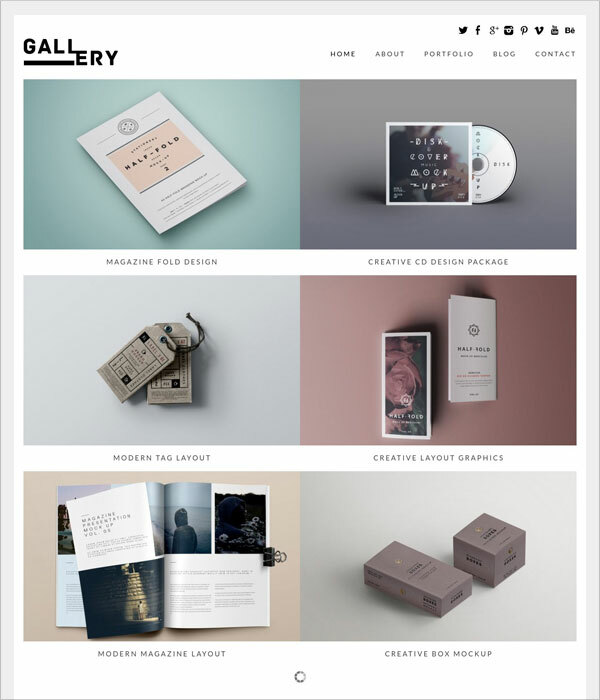 Gallery is a minimalist portfolio WordPress theme that is perfect for digital artists, photographers, creative agencies and anyone who wants to build a nice online portfolio. The theme is easy to customize thanks to a handy Theme Options panel. If you’re looking for a responsive, seo optimised WordPress theme that has a clean grid style layout, be sure to try this theme. After all, it’s free to download and use. 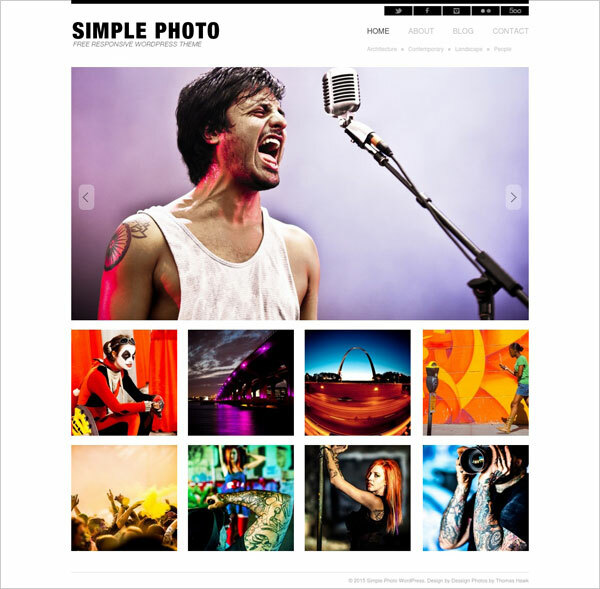 Simple Photo is a clean portfolio WordPress theme meant for photographers, web designers and other creative folks. The theme has an elegant design that is great for showcasing your photos, illustrations and other artworks. Some of the key features are responsive design, image slider, grid style layout, custom menu options, etc. This free WordPress theme is a great way to build a beautiful photography website. Meet Vector, a stylish portfolio WordPress theme for agencies and freelancers. The theme is responsive, clean, and flexible. The homepage in enhanced with a fullscreen image slider. As for the other features, these are left sidebar, fixed navigation bar, grid style portfolio pages, etc. Vector is designed specifically to show the awesome work of photographers, illustrators, web designers and other creative individuals. It looks elegant and offers you extensive customization options to personalize your website. 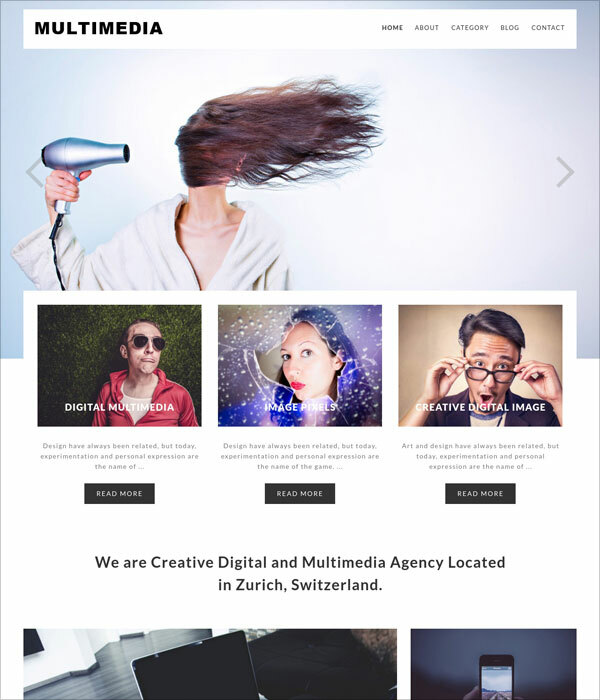 Multimedia is a feature-reach portfolio WordPress theme that is geared towards freelancers and businesses that need to build a stunning online presence. The theme is responsive and SEO friendly. It can be easily modified via a Theme Options panel. Multimedia comes with a stylish layout, a sticky menu and a full-width image slider in the header. However, our short summary doesn’t include every single detail that’s available in this WordPress theme so we would highly recommend you to check the live demo to test drive Multimedia and see if it’s right for your project. PageDown is a stylish one page WordPress theme beautifully designed for photography websites and other types of portfolio websites. The theme is responsive and enhanced with an impressive image slider, exciting hover effects, a fixed navigation bar and many other features. PageDown could be a good choice for individual photographers as well as web design agencies and other creative studios. 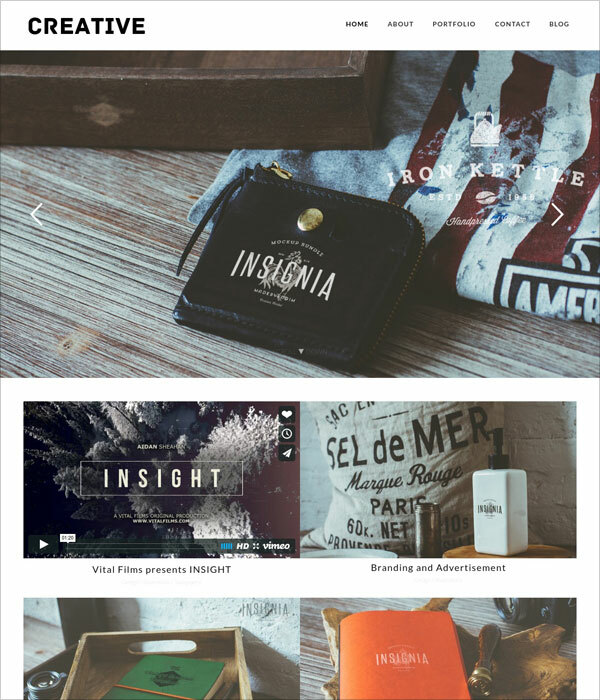 Test drive this portfolio WordPress theme and see if it suites you. 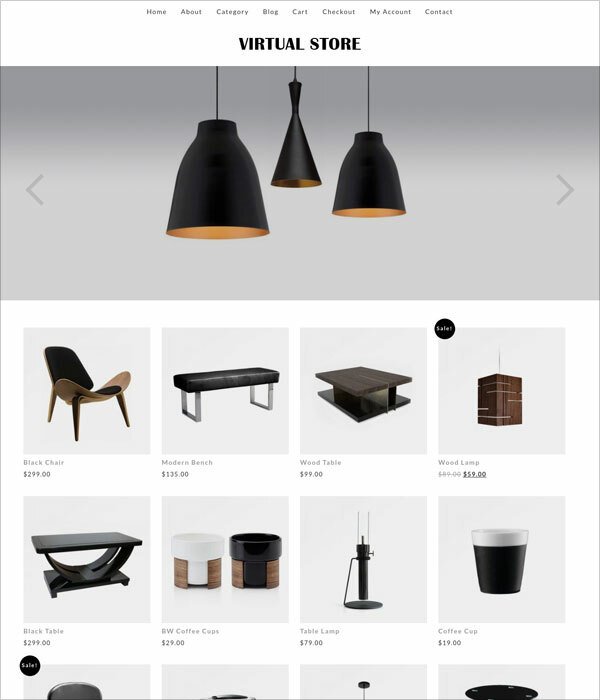 Virtual Store is a premium WooCommerce theme with a clean and mobile friendly design. This theme is geared towards those of you who do not only want to showcase your creative works, but also want to sell them online. Using the Virtual Store theme you can build a 3 in 1 website that would consist of a portfolio, a blog and an eCommerce shop. If you like responsive, minimal, seo optimized and highly customizable grid style layouts then you will definitely like this stylish theme. 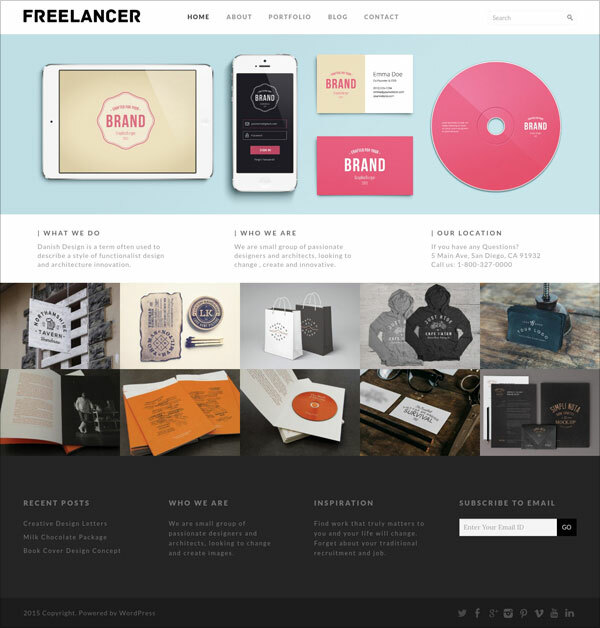 Freelancer fits today’s list of portfolio WordPress themes perfectly. The theme is built with simplicity in mind. It has some nice features like responsive image slider, zooming, sticky menu, featured posts, etc. The theme comes with a Theme Options panel, so you will not need to touch a line of code while styling your website. With Freelancer you’ll be able to build a stunning portfolio to promote your best works in a stylish and professional manner. Check the live demo and decide if this theme would be a good fit for your specific needs. 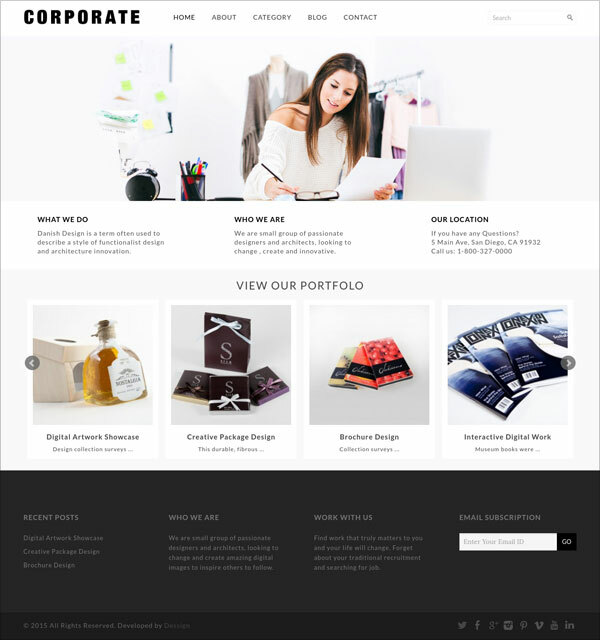 Corporate is a premium responsive and highly customizable WordPress theme that is perfect for business websites and portfolio websites. The theme has a grid style layout and many useful features including an image slider, a sticky menu, featured posts, hover effects, etc. Corporate offers standard WordPress pages such as Home, About, Portfolio, Blog, Contact, but you’ll be impressed by their elegant style and professional look. Clean Folio is a responsive WordPress theme that has an elegant, minimalist look and feel. With this WordPress theme you can build a neat portfolio to display your work. Clean Folio has many useful features (responsive layout, clean design, hover effects, featured blog posts, fixed navigation bar, etc) and you can easily modify it to fit your needs. So, there you have it – 15 beautiful free and premium WordPress themes that would make a great choice for any portfolio website. As you can see, free WP themes can look professional and stylish. And you can always go with a premium WordPress theme if you need advanced features and free support. Have we missed some of your favorite portfolio WordPress themes? Leave a comment.